While still on Lincolnshire themes, it struck me that when in Louth I really should take a photograph of at least one of the cast-iron street signs that are a feature of the town. These modest items of street furniture make a huge difference to the character of a place. So many towns have modern street signs, made of thin metal (or even plastic) – no doubt cheap to produce and easy to clean and maintain, but totally lacking in character and without much in the way of visual flair. Louth is one of the places that have preserved a high proportion of their Victorian signs. They score highly for clarity – the bold, clear, lettering sees to that. They are distinctive, because, although other towns have this style of sign, none are quite like the ones in Louth. They are clearly very durable. They do need looking after – repainting every so often, particularly. But it’s a price worth paying in my opinion. The lettering, by the way, is in the style old-fashioned sign writers and those who care about the design of these things mostly know as Egyptian. That has nothing to do with ancient Egypt, but everything to do with the design of the letters, which are distinguished by the way the serifs have no curves (or very minimal curves) – they are basically short, straight-line embellishments to the ends of the main strokes. * These particular Egyptians are squarish in proportion, and have some variation between the width of the strokes, but not extreme variation. They work really well painted in black against the white background, within the slender black frame line of the whole sign. The other lovely touch is the incurving corners – another bit of distinctiveness. Hats off to Louth for preserving these exemplary signs. * If this was a font for printing, I’d be describing the letters as having ‘slab serifs’. But I take ’slab serif’ to be a term from printing and typography. These signs, on the other hand, come from the world of the sign writer and sign-maker, so I use the term traditionally used in that world: Egyptians. Not far from the A16 in Lincolnshire is the small village of Haugham. * It’s a place that means something to me because, long ago, before I was so much as thought of, my newly married parents lived there. The view from their house took in the village church and it was impressed upon me, when my parents reminisced to me about their early years, that the spire of this church was special because it had been built in imitation of the great and graceful spire at Louth, the local market town (where my mother had worked before she was married), and Louth, as we all knew, had and has a very special spire. Well, it’s true. All Saints’ Haugham was built between 1837 and 1840 to designs by George Willoughby§ at the behest of (and with funds provided by) the vicar, George Ascough Chaplin.¶ It’s very small, this church, and modestly constructed of brick with cement render. But the spire is similar to the one at Louth in its overall outline – the large pinnacles, linked by buttresses to the crocketed spire, together with the generous window on the upper storey certainly create a similar impression. It’s not a direct copy, but is certainly a homage. 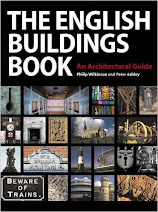 § Some give the architect as W A Nicholson; Pevsner attributes the building to Willoughby (a Louth architect), saying that he may possibly been have assisted by Nicholson. ¶ The Chaplins were local landowners and some members served as MPs in Lincolnshire. They certainly were landowners at both Haugham and nearby Tathwell in the 19th century, but I don’t know whether George Ascough Chaplin was squarson or if he was a benefice-holding younger son of this illustrious family. 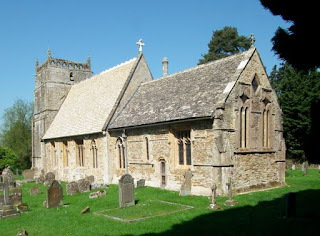 † All Saints, Haugham, is now in the care of the Churches Conservation Trust. There is more about the church here. I continue my group of posts looking back over buildings I visited earlier with a couple of Lincolnshire favourites. 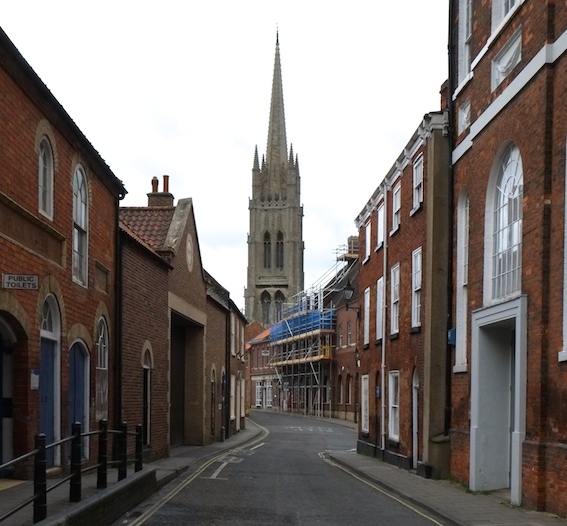 I’ve been to Louth many times, and whenever I’m there I look at the spire of the town’s parish church. If truth be told, it’s difficult to avoid looking at it – it’s by far the tallest building in the town, and dominates many views. As de Maupassant said of the Eiffel Tower, the only way not to see it is to be inside it. But while some people might not like the Eiffel Tower, what’s not to like about this glorious steeple? It’s not only the tallest parish church steeple in England but, to my mind, the most beautiful. Everything leads the eye upwards: the windows and openings, narrower in proportion at each level until we reach the graceful ogee canopies of the upper pair; the buttresses, stepping inwards as they rise* and leading effortlessly to the four pinnacles that surround the spire;† the upward-sloping flying buttresses that connect the pinnacles to the spire; and the spire itself, 135 feet from battlements to finial, its crockets beautifully carved and spaced (closer towards the top) with art and care. The interior of the structure contains wonders too – a cavernous space at ground level and inside, at the top of the tower, the original medieval treadmill, known as the ‘wild mare’, for lifting stone and bells, one of only three medieval examples left in this country. Louth’s tower and spire are discussed and illustrated in detail in Julian Flannery’s fine book Fifty English Steeples, which I reviewed before Christmas. 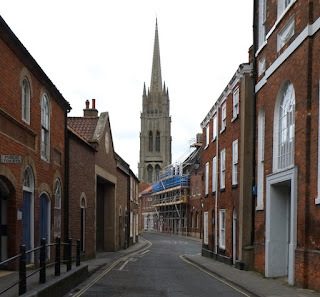 I was pleased that the author likes this steeple as much as I do – it’s the culminating number 50 in his book both because of its superiority and because of its date – the spire was completed in 1515, at the very twilight of the medieval period. Flannery criticises very little of the design of the steeple itself – the tracery in the lowest window is a little pedestrian.§ I agree with his assessment. The completion of the spire was greeted with much celebration, including, of course, bell ringing and the distribution of bread and ale to all present, and who can blame them for carousing? *As is usual; although slightly less usual is the way the set-offs don’t coincide with the string courses that mark off each stage of the tower. The effect feels a bit awkward to begin with, but the overall impression is one of upward-sweeping power. †Not strictly necessary structurally, but aesthetically highly successful. §He also says, fairly, that the aisles are disappointingly low compared with the steeple, and he is not enamoured of the setting near a road…but that was not the fault of the original mason and Flannery's overall assessment is very positive. This is one of those jaw-dropping buildings that constantly stop me in my tracks as I walk around English towns. 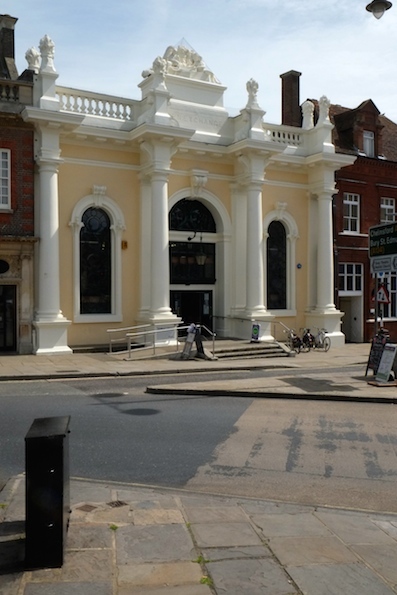 A corn exchange was a major centre for a country town and an important adjunct to a market. Corn exchanges are often imposing buildings, symbols both of civic pride and rural productivity. They have carvings of reapers or goddess like Flora on them, big doorways so that you can get in and out with ease and sacks, and are designed to be both landmarks and useful. This one was built in the 1840s and makes its mark with a giant order, a tall door and windows, and the requisite corn-related decoration: sheaves of corn at the top of each column and a group of resting harvesters in the centre of the parapet. No doubt for quite a bit of the last century it was still a much-used building and a local hub – read Adrian Bell’s classic book Corduroy (and the sequels Silver Ley and The Cherry Tree*) for accounts of English farming in the interwar period, in Suffolk especially, to get the idea of how important this business was. But by the 1960s, this building was ‘just’ a landmark, and no longer used for its original purpose. It was saved from demolition thanks to a local campaign and is now the town’s library.† A nice example of creative reuse. * These gentle, reflective books about country life have been reprinted and can also be found in wonderful early Penguin editions. Maybe Bell made country life a bit gentler and more idyllic than it really was (though it’s not always easy for the young farmer whose life they chronicle) but there is much to like in them, I find, and much to learn. If I’m perhaps a little indulgent towards the generally rosy picture of country life they paint, maybe it’s because they describe life on the land in a period when my own father was a farm worker, somewhat to the north of Bell’s territory, on the Lincolnshire Wolds. † Now libraries themselves are under threat. But I hope Sudbury can sustain one, and sustain this outstanding building. 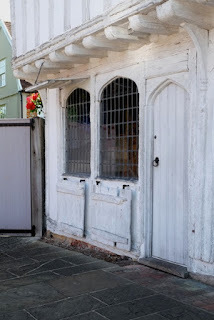 I regularly give a talk about the history of shops and shopfronts and I’ve taken to using this image to explain what late-Medieval shops could look like and how they sometimes functioned. In the 15th century, glass was still an expensive commodity, restricted mainly to churches and high-status houses, so there were no shop windows like those of today. So, if you had a shop, you had unglazed openings, closed by shutters. This example has pairs of shutters, upper and lower, and in the ‘closed’ position the lower shutter would hinge upwards and the upper one downwards, to seal the opening. During business hours you could open the shutters as shown, or the lower one could be propped with a trestle and act as a counter or stall. The shopkeeper could put goods on it and stand inside. In this period, of course, a lot of business was not done in shops at all, but on market stalls. But a few trades – those who needed work space, for example, from carpenters to butchers, had workshops and could sell from there. This sort of shutter arrangement worked for them, allowing them to maske things and sell things in the same space, and live above the shop. It’s very unusual to find this kind of shop front today. This one, part of the Guildhall at Lavenham, is notable survivor and a useful visual aid when I'm giving my talk. Many are the Swan Inns of England† and they often have fine signs, but there are few to beat this one. * Edmund was in custody during the latter part of the reign of Henry IV because of his rival claim to the throne and his family's part in efforts to depose Henry. When Henry died and his son Henry V became king in 1413, Mortimer was freed, made a Knight of the Bath, and became a loyal counsellor of the young king. Edmund founded a college of canons at Stoke-by-Clare in 1414. † I have previously admired the Swan at Wells and the Three Swans at Market Harborough. 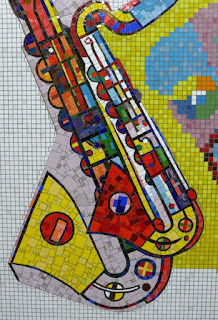 Yesterday I did a post about the tiled decoration by Eduardo Paolozzi at Tottenham Court Road underground station in London. At the end of the post is a link to a YouTube video about the alterations to the decoration and the restoration of the tiles that remain. Unfortunately, those of you who subscribe to my posts by email may be unable to see or access the link. So, if you are receiving this by email, the original post and link are here. And, for those who cannot access the video, it is on YouTube here. 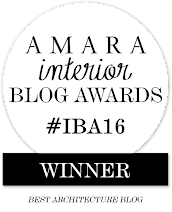 Or, on the blog's home page you can just scroll down to find the original post. One would have to be unobservant (or very lucky) to have spent any time in Central London over the last few years and not come across the Crossrail development. This enormous underground engineering project has disrupted the capital in all sorts of ways, and one of the centres of this disruption is the complete rebuilding and massive expansion of Tottenham Court Road underground station. One thing that I’ve been aware of for some time is that the unique and very special tiled decoration by Eduardo Paolozzi is being altered in the process. These murals are perhaps the greatest work of public art by this pioneer of Pop Art, a riot of colour* in the sometimes dull world of the underground, and, at about 23 years old, part of our history already. Some parts of the station with Paolozzi tiles are being demolished or rebuilt, so some sections of the mural have been removed to Edinburgh, where the National Galleries already have a large Paolozzi collection and where Paolozzi was a student and, later in life, a teacher. The rest of the tiles are being cleaned, restored, and in some cases moved from one part of the station to another. This has been done with great care, and the video to which I link below, produced by Transport for London, shows something of the enormous effort in planning, engineering, and work involved. True, part of the intention of the video is PR for TfL. But it shows that the professionals who have worked on the project are just that, professionals, and their devotion to the project, their commitment to the murals, and the pains they have taken shine through. What’s more, the video gives a better impression of this enormous work of art than I can in one or two photographs. The artist’s feel for colour, his sense of musical and visual rhythm and syncopation, his inspiration from all kinds of places and things from jazz to sweetshops, is vividly caught. This station is going to be impressive and the Paolozzi murals will play their part. And that will be some recompense for the inconvenience that, as they say, this work may have caused. *And a feast of monochrome pattern on the Northern Line platforms. In 1571 a group of merchants in the Cotswold town of Burford founded a grammar school. Their leader was the appropriately named Simon Wysdom, whose name features in an inscription over the doorway of the old school building, which still exists, a solid-looking structure of Cotswold stone in the centre of the town. The masonry is quite high quality – coursed squared rubble blocks, one step away from the super-smooth ashlar of the very highest status buildings. However, the structure is perhaps not as quite solid as it seems. At some stage there has been some instability and tie rods have been installed to stop the walls bulging outwards. These ties are metal rods that pass all the way through a building from one exterior wall to the other, fixed on the outside with bars or discs that hold the wall in like a corset. Often the rods are heated up immediately before they are inserted and the outer bars or discs fixed on, so that they contract as they cool down, ensuring the tightest fit. The bars on the outside can take various forms. One of the most common is a large X-shape, so that the containing effect is spread across a large surface of wall. Here, there’s an added touch: instead of Xs, the rods end in the three initials B, G, and S, for Burford Grammar School. As well as holding in the wall they act as a bit of advertisement. 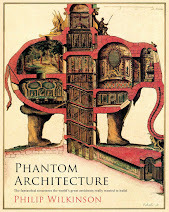 Structural, educational, promotional, and ingenious in one.